I was lucky enough to have been interviewed by two Fortune-500 companies, to have passed both interviews successfully and to have been hired by both companies. Moreover, in both cases I was trained how to do those interviews from the inside. This made me realize most of the mistakes, that people made on those interviews on one hand. And on the other hand, helped me perfect my interview skills. I would admit here that any case is different and any company is different than the rest. If you read the whole article and you still feel uncertain about the upcoming interview, please feel free to reach out to me on Facebook, Twitter or Email. They (the hiring people) always say that, but you (the interviewee) never actually listen. The purpose of the interview is for the company to make sure that you are the right person for the job. And for you to make sure that the company is the right place for you. There are companies where you will immediately see that there is no chemistry between you and the interviewers. Have the courage to immediately end such interviews! This will help you build trust in your skills. And will not waste your time. Most of the times a company knows exactly what kind of specialist they are searching for. If not, this is bad for the company. Usually there is already a defined role within a team that is missing and should be taken from someone (you!). This translates into a set of skills, which the perfect candidate should posses. 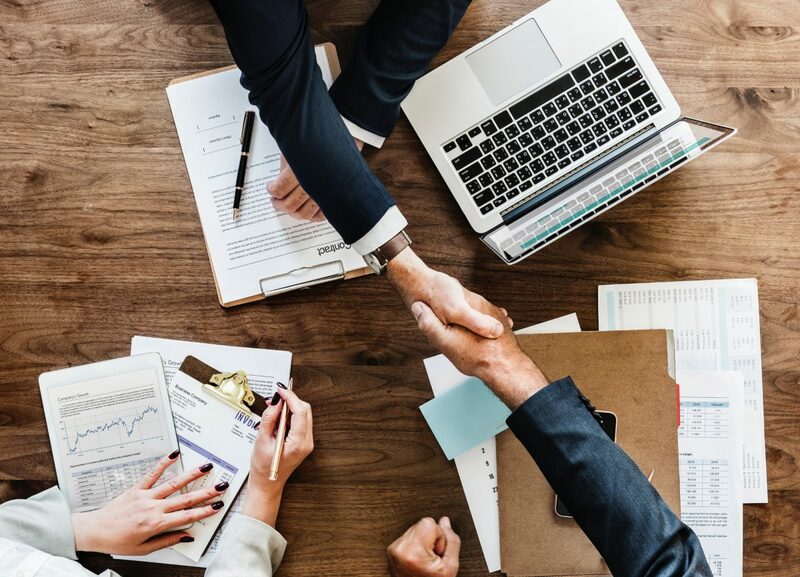 In order to test if a candidate has those skills, the interviewers will try to put the interviewee in situations that might reveal that skill or the lack of it. This is usually measured with the STAR technique, which will be covered later. Another topic on the agenda of the interviewers is to make sure that the personal culture of the candidate matches the company culture. This is not very tangible and most often the “gut feeling” should be considered. There is nothing you can do, if your culture does not match the target culture. And in any way, you would not like to work in such a place. Last but not least, you might be put into an absurd situation with a provocative question or problem. The task here is to see how you would handle a difficult situation and what tools you would use to solve the problem. This is also something very hard to fake, so I would suggest to stay true to yourself. That task can sometimes take the form of an “assessment center”, which I will covert in one of my next posts. What you get from an interview is also very important. First of all, you get to test your skills and see if you have reached the level required by the company. It is OK if you do not. There is nobody that excels at each and every interview in their life. If you are applying for a position that is one level ahead of you, you will get a reality check if you are good enough. And your most important task is to find out if you want to work at that position. Prepare and ask plenty of questions to allow you to understand your “future” job description and your “future” responsibilities. Ask as many questions as the interviewers allow. The STAR technique is one of the tools used by the interviewer to assess your skills. This is just an example, as there are other similar tools. Understanding the way things work is more important as the tool itself. STAR stands for Situation, Task, Actions, Result. What is basically means is that the recruiter is trying to identify a context (Situation) in your experience where you faced a specific problem (Task). Based on your experience and information you took a certain steps (Action) to solve the problem. And most importantly, your actions lead to a certain outcome (Result). As an interviewee you should always try to structure your experience to match that framework. Why? Because it would not be enough if you had a problem, tried to solve it and did not measure the outcome. Or if you had a problem that you solved, but could explain why. Or if you solved a situation that was not a problem and you received good results. An elevator speech is a clear, brief message about you. It communicates who you are, what you are looking for and how can the interviewer company benefit from you. It should take no longer than 30 seconds (or the time it takes for an elevator to reach its destination). You should prepare your elevator speech in general and fine tune it for each interviewer company. Improving and eventually mastering your interview skills is achieved by preparation with the STAR technique in mind. It is like when studying for the SAT, you make sure you learn the structure of the exam first. And then, based on your skills and strengths, go through the material and learn it in a way that will be most useful during the exam. In this step you will attempt to read between the lines and try to find out what exactly does the company want. Unfortunately, most of the companies use templates for the job opportunities. But in any case you should try to extract as much information as possible. Write everything down and especially emphasize on the responsibilities. Then try to search what responsibilities are required for the desired profile in other companies. There might be some more clues there. Do the same with the name of the team that you will be joining. Last but not least, research the company mission statement and vision. It should be available on the main page. There should also be a set of values, in which the company believes. These are even more clues on what the company is searching for. This is where your interview skills come into play. At this point you should have a vague idea where will eventually be working, what will be expected of you. And most importantly, you will have a list of responsibilities, skills and competences that you would have. It is helpful if you already know your skills. Check out this article about finding your strengths and this article about evaluating your strengths on the topic of finding your skill. This step depends on your personal style and therefore you can approach it differently. The main idea is to review all the items on your list (responsibilities, skills and competences) and try to prepare two or more anecdotes from your experience, where you showed the required skill. I would personally write the whole story down and then try to rehearse it as many times as possible. Some of my customers find it easier to only write bullets in order not to forget what story are they telling. Remember the STAR technique. Make sure that each story/anecdote has a defined situation, clear task, a set of actions. Do not forget about the result. It should be as measurable as possible and if possible the measures and the success criteria should have been formulated before you started. Do not forget to write, review or tweak your elevator speech. Ideally, it should match your other stories. Based on your understanding of the job opportunity, the culture of the company and your skills, you should already have a few questions to the company. Prepare as many questions as you can that would make it clearer for you what you are eventually going to do. Ask about the team, the tasks, the projects. Everything that would help you understand the position better and make up your mind if you want it or not. How would you see a person with my profile in the company 3 years from now? What would you assign a person with my profile on his or hers first working day? In order to perfect your answers and depending on how much time you have, you may consider rehearsing your answers during the days before the interview. I personally would ask myself a random question (or pick a random bullet from the list with skills) and simulate an interview situation. I would either tell the complete story or just list the S, T, A and R in my head. Finally, I would also try to figure out what kind of follow-up questions could follow. But this is probably too much. I have heard it many times from many people and customers who are good at presentations, or other performance. You should stop reviewing/rereading your notes at some point before the interview. For me the period is about 1-2 hours, for others it is 5-10 minutes. The purpose of this step is to give your brain some time to relax and refocus on the upcoming task. If you obsess to the very last second with the bullet and story that you fear you have forgotten, you will stress too much. Ideally you could meditate and practice mindfulness. Or you could start a conversation with one of the other candidates. You could also review some brochures, if you had already arrived to the office where your interview will take place. Breathe deeply and try to calm yourself when somebody finally comes to pick you up. Remember that you are also interviewing them, not only the other way around. 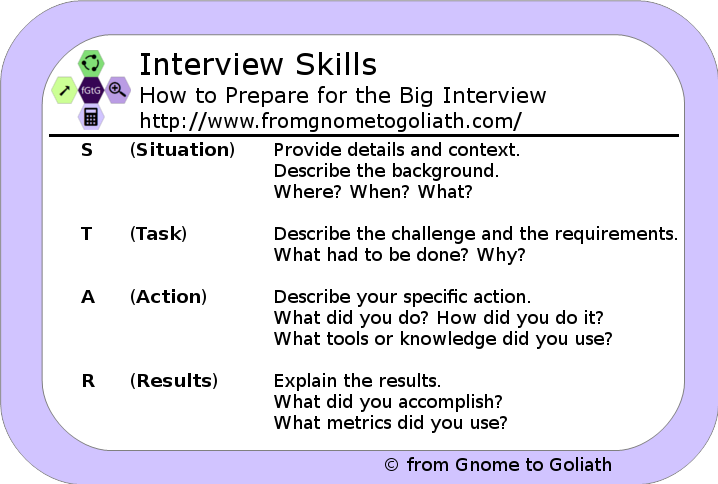 Remind yourself about all the interview skills that you have improved in the preparation process. Do not concentrate on your bullets, lists and do not rehearse anything more. Be present in the moment. Depending on the situation, you may wish to revert the roles in the interview, at least in the beginning. Use this advice with caution. This is a list of unexpected steps that would make you stand out. Instead of answering the first questions, ask for permission to ask a few questions about the position. For example “to make sure that the position is right for you”. Ask the interviewers to brake the “student teacher frame”. For example do not sit across the table, but try to sit on the shorter side so that you could be facing the interviewers sideways. If they offer you a coffee, juice or water, accept the offer and use the opportunity to scout the room and make yourself comfortable with it. Start a small talk conversation about the weather, or the traffic, or the building, or the business model of the company. It will also make you more comfortable. Do not forget to ask your questions, when you are given the chance! If the interviewers do not give you this information, ask what the next steps in the hiring process are. Mastering your interview skills requires a set of steps that need to be undertaken. First of all, you need to understand the purpose of the interview from the “other side” – the side of the hiring company. Then, you have to understand the process that the big companies follow to pick the correct candidates. 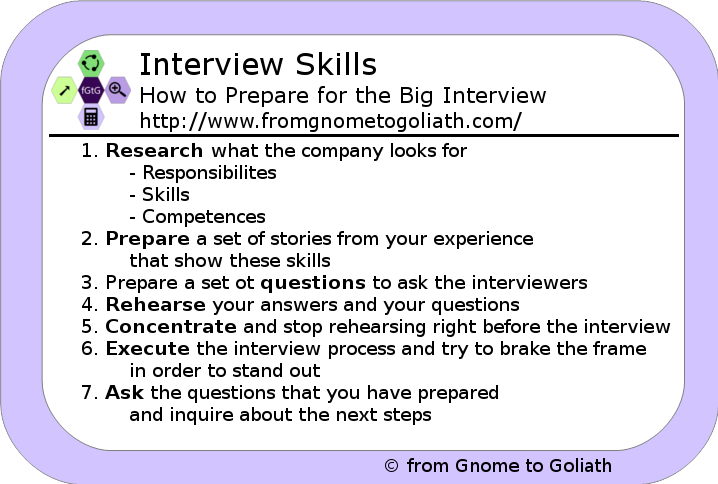 And last but not least, you have to learn how to prepare yourself for each interview.